Please note that this meeting is suspended while arrangements for a new meeting are put in place. This is a very informal meeting – an opportunity to come along and meet old friends or make new ones. 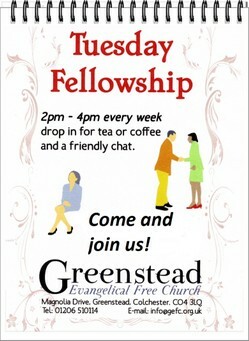 We meet from 2 to 4 p.m. on Tuesday afternoons and enjoy tea, coffee and a chat. It’s a “drop-in” kind of meeting, so you can come and go as you please, and stay for as long or short a time as you like.